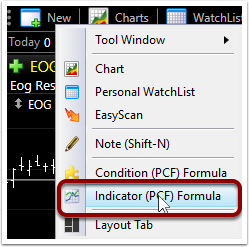 Indicator Formulas are PCFs which return numeric values. 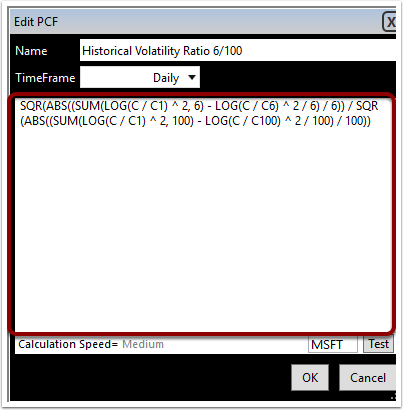 Condition Formulas are PCFs which return Boolean (true or false) values. You can enter a Condition Formula using the following directions. It will just give a a message letting you know it is going to be saved as a Condition Formula instead. This is not an error. Select New | Indicator (PCF) Formula in the menus. 1. Select New from the menus near the upper left corner of the main TC2000 window. 2. Choose Indicator (PCF) Formula from the drop-down menu which appears. 4. Select the time frame you wish to use. 5. Type or paste in your PCF formula. You can usually use ctrl-c to copy and ctrl-v to paste. If you are having problems when copying and pasting, you might want to try copying and pasting into a text editor (like Notepad, not a word processor like Word) and then copying and pasting from the text editor into TC2000. You can test the formula you like by clicking the Test button using the symbol entered to the left. Value = True or Value = False are not error messages. These messages just mean the formulas returns true or false for the test symbol. This would also mean this is a Condition Formula and not an Indicator Formula (which returns a numeric value instead). 6. Click OK to save the PCF and open targeting mode. Targeting mode lets you add this PCF to an existing chart, watchlist or scan, or create a new scan or sort using this indicator formula. If you do not want to use the PCF at this time you can press "Esc" to exit targeting mode. There are other ways to create PCFs in different parts of the program where it is convenient. Some of these options are given below. Select New | Condition (PCF) Formula in the menus. 2. Choose Condition (PCF) Formula from the drop-down menu which appears. 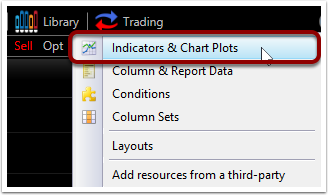 Select Library | Indicators & Chart Plots | Formulas | Write Indicator Formula in the menus. 1. Select Library from the menus near the top of the main TC2000 window. 4. Select the Formulas tab in the Add Plot window. 5. Select Write Indicator Formula. 7. Select the time frame you wish to use. 8. Type or paste in your PCF formula. 9. Click OK to save the PCF. Select Add Column | Write New Formula in a WatchList or EasyScan. 1. Select Add Column near the top of the WatchList or EasyScan. 2. Choose Write New Formula in the Insert Column window. 6. Click OK to add the PCF as a WatchList Column. This will not save the PCF for use anywhere except as a WatchList Column in this particular WatchList or EasyScan. Select Alerts | Create New Alert in the menus. 1. Select Alerts from the menus near the top of the main TC2000 window. 2. Choose Create New Alert from the drop-down menu which appears. 4. 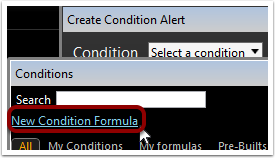 Choose Condition | Select a condition in the Create Condition Alert window. 5. Choose New Condition Formula. 9. 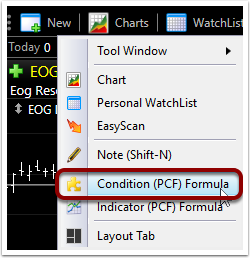 Click OK to save the PCF to use the new Condition Formula as the basis of your alert.